Last year, Ken Loach followed up his delightful 2009 Looking for Eric with a marvelous little gem of a movie where the 2% of single malt whiskey that evaporates during the aging process, known as "the angels' share," becomes a metaphor for humanitas. Like Kirk Jones's 1998 Waking Ned Devine, The Angels' Share and Looking for Eric recall the golden era of Ealing Studios – the oldest continuously working studio facility for film production in the world – that churned out one memorable little movie after another, including the 1949 Whiskey Galore! directed by Compton MacKenzie and Charles Crichton’s The Titfield Thunderbolt (1953). What these films have in common is that the material object of the quest is merely a vehicle for the quest's larger purpose: the power to bring community together. In these narratives, community, not family, functions as the central social unit, the ultimate source of human meaning and communion. Compton MacKenizie's 1949 Whiskey Galore! As in Whiskey Galore! and Waking Ned Devine, the deception requires the cooperation of the entire village in The Grand Seduction; Pride widens the lens by bringing two incongruous communities together; while St. Vincent narrows it by homing in on incongruous neighbors; and Calvary turns the community on its head in an existential, absurdist variation on the theme. There is an episode of the brilliant television series Northern Exposure called "Our Tribe" in which tribal elder Gloria Noanuk invites Dr. Joel Fleischman to be adopted by her tribe. Joel engages Ed Chigliak, his Tlingits friend, to try to understand what this means. JOEL: Ed, let me ask you something. What does belonging to your own tribe mean to you? 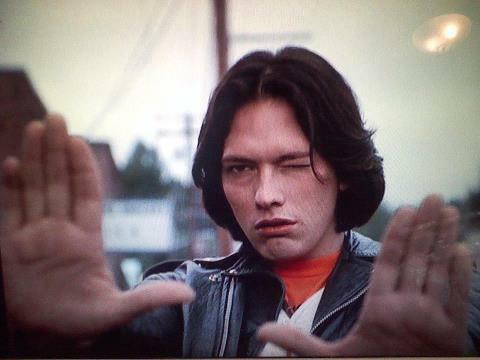 ED: Well, I was raised by the tribe, but since I didn't have parents, I was passed around a lot. I never really thought about it. I mean, belonging to a tribe. JOEL: I belong to the Jewish tribe, so to speak, but I'm also an American, you know? What does that mean? I mean, is there an American tribe? More like a zillion special interest groups. In my own case, I am a New Yorker. I am a Republican, a Knicks fan. Maybe we've outgrown tribes, you know? The global village thing. It's telephones, faxes, CNN. I mean, basically, we all belong to the same tribe. ED: That's true. But you can't hang out with five billion people. Canadian actor and director Don McKellar’s The Grand Seduction is a remake of the French Canadian movie Seducing Doctor Lewis. The villagers of remote Tickle Head, Canada, have been thwarted for years in their attempt to snag a doctor. Mayor Murray French (Brendon Gleeson) contrives to convince the town folks to spiff the place up in an attempt to make it appear a desirable place for a young doctor to settle down – though, of course, their provincial idea of desirable does not jibe with a young doctor's. Everyone is on the dole and are themselves seduced by the prospect of a petrochemical company siting a plant in Tickle Head, but the deal always falls through for want of a resident doctor. Madcap machinations ensue on both fronts – for doctor on the one hand and corporate contract on the other – as the town scrambles to carry out the zany scheme. The Grand Seduction channels Bill Forsythe’s 1983 Local Hero: as corporate farming and fishing have become the norm, local economies in steady decline turn to corporatized global giants for rescue. But The Grand Seduction fails at Local Hero’s underlying theme. Where Local Hero sees the tragedy in the sacrifice of nature in the name of jobs, The Grand Seduction is just happy to have the work – oh, and the doctor, too. Pride is the true story of Lesbians and Gays Support the Miners, unlikely saviors to one of the Welsh mining villages caught in the draconian efforts of the Thatcher regime to crush the National Union of Mineworkers. From June 1984-June 1985, LGSM sees the villagers through a year of government imposed hardship and penury. One could take issue with the film’s oversimplification of the record. At the same time, in other hands the story could have devolved into sentimentality and mawkishness, but Matthew Warchus’s delicate direction gives the film a generosity of spirit that cannot be denied. 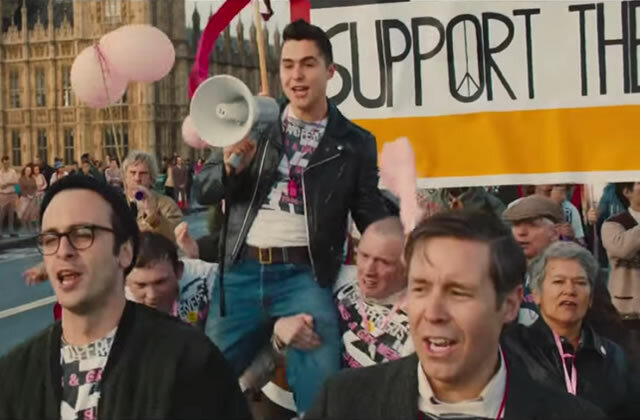 Mark Ashton (Ben Schnetzer) is an ardent activist whose sympathy is always aligned with the underdog, no matter who it might be. His recruits are six characters in search of a cause until Mark, realizing that tabloid demonization and police harassment of the gay/lesbian community have been diverted to the miners, rallies for the strikers’ cause. Tradition demands the village host delegations representing philanthropies from whom they receive aid, but their hospitality is tried under the circumstances. Three members of the union council – Imelda Staunton’s irrepressible Hefina; Bill Nighy’s union secretary and all-round conciliator, Cliff; and Jessica Gunning’s maternal Sian – hold to the principle that generosity is to be shown gratitude. The two communities learn soon enough that they have more in common than their differences might make it seem. Salvation, it turns out, is reciprocal. The emergence of AIDS in the gay community is skillfully underplayed, touched upon overtly only once, which makes our knowledge of what is to come somehow more powerful and heart wrenching. Bookended by annual Gay Pride parades, the film opens to Pete Seeger’s “Solidarity Forever” and closes with Billy Bragg’s “There Is Power in the Union.” At its center is an a cappella rendition of “Bread and Roses” that begins with Welsh vocalist Bronwen Lewis. As she is joined by one after another of the village women, and then their menfolk, the song takes on an harmonic power through which I had to stifle sobs. Pride bears witness to the power of solidarity and rings with the anthems of labor. 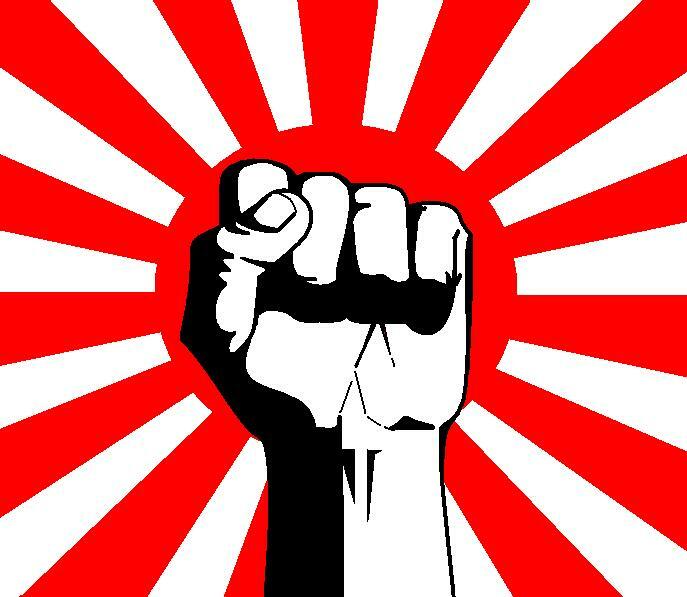 Clench your fist! Now raise it with me! Last year I said that Seth Gordon's Identity Thief co-starring Jason Bateman and The Heat, directed by Paul Feig (Bridesmaids) and co-starring Sandra Bullock, would both be really bad movies were it not for Melissa McCarthy's kinetic energy, rapid-fire improvisational delivery, and wildly self-confident physicality. The phrase "over the top" was invented for her. She is queen of the pratfall, empress of slapstick, an impish roughhousing buffoon who, without your even knowing it, is creating a multidimensional character that she springs on you unexpectedly halfway through the movie. McCarthy burns with a magnetic attraction that kindles the chemistry between herself and whoever is cast opposite her. Now she has outdone herself as working single mom Maggie in a remarkably controlled performance where again her generosity as an ensemble actress shines. Bill Murray, who has always been possessed of a sardonic genius, as the eponymous Vincent does not disappoint here. 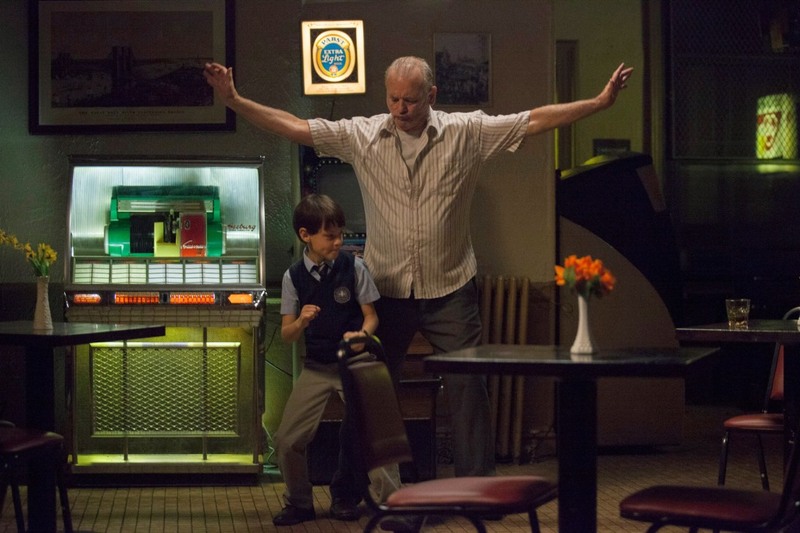 Together Murray and McCarthy, along with a great turn by Naomi Watts as a pregnant Russian émigré pole dancer, take a script that could have gone all Disney cute and smash corny clichés (There are unlikely saints among us) into seriocomic virtuosity. Jaeden Lieberher as Maggie's son Oliver conveys admirable nuance himself, while he and Murray make a wonderful buddy movie duo, and the versatile Chris O'Dowd as Oliver's teacher Brother Geraghty brings some ethnic charm. Written and directed by John Michael McDonagh, Calvary is set in a village in County Sligo where its shepherd is Father James (Brendan Gleeson who co-starred with Don Cheadle in 2011’s wonderful The Guard, which McDonagh also wrote and directed). The villagers, full of cynicism, tension, and resentment, look out for their own self-interests at best, and at worst work to spitefully subvert what marginal shred of community remains. Amidst this toxic atmosphere a parishioner steps into Father James’s confessional, and, after describing his childhood abuse at the hands of a priest, vows to take revenge by killing Father James in one week’s time. Vengeance can only be exacted, he explains, if the victim is – as he, the child, was – innocent. A parallel scene takes place later. 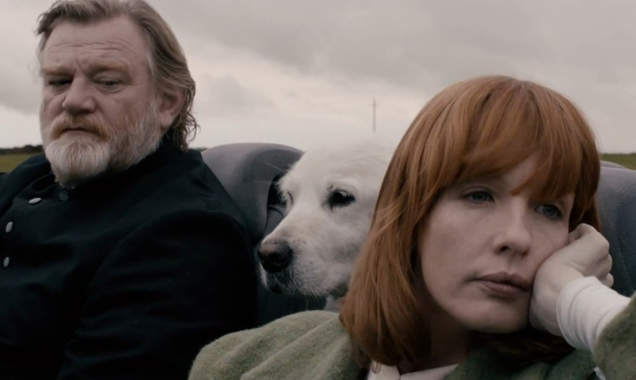 Father James took the cloth after becoming a widower and has brought his daughter (Kelly Reilly) to the village to recover from a suicide attempt. In the confessional she says, “I belong to myself, not to anyone else.” “True,” Father James replies. “False.” We are individuals, but without community, we are lesser beings.